I have had people write me and ask how to clean plastic canvas. 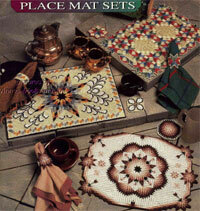 One woman was afraid to make placemats because she wasnâ€™t sure how to clean them. Treat your plastic canvas like a find wool sweater. Use a cold-water wash solution like Woolite, just to be safe. If you have stains, pre-spot as you would for any garment before washing, then soak to clean. If the mats wonâ€™t fit in the sink, use the bathtub. Rinse thoroughly and lay flat to dry on towels. Be sure to use colorfast yarns. To freshen plastic canvas items between washing, remove dust by vacuuming them once a week with brush attachment or hand vacuum. Donâ€™t be afraid to make placemats with canvas. There are so many pretty designs that you can make and they do make beautiful gifts. Just be sure to include washing instructions with the gift. It is so easy to clean plastic canvas that you shouldn't forget this craft just because you don't know how to cleam them.